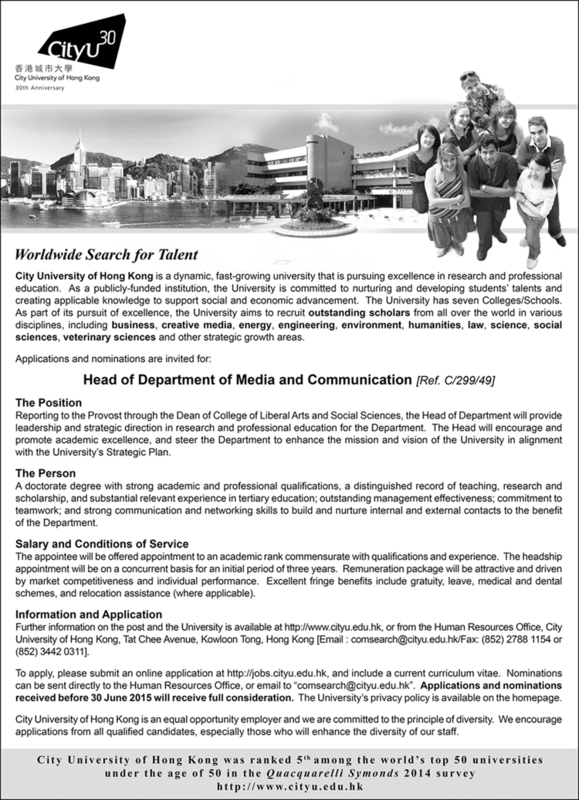 Chair Professor / Professor / Associate Professor / Assistant Professor, Department of Media and Communication, City University of Hong Kong. Deadline: Open until filled. Specialization sought is open, with preferred areas including Mass Communication, Digital Journalism, Digital and Social Media, and Graphic/Visual Communication. Candidates for Chair Professor/Professor should command a superb record of scholarly achievements and exert leadership in the field of media and communication. Candidates for Associate Professor should have an outstanding record of scholarly achievements in both teaching and research, a strong record in research grant coordination and/or academic management expertise. Candidates for Assistant Professorshould have a solid record of, or evidence of high promise for, scholarly achievements in both teaching and research. Preference will be given those who are willing to teach skills-oriented courses; and possess teaching or practical experience/expertise in Multimedia/Data Journalism, Visual/Video Production, Graphic Design, Digital Media Planning, Social Media Management, Mobile Communication or Game Studies. Chair Professor/ Professor/ Associate Professor/ Assistant Professor, Department of Media and Communication, CITY UNIVERSITY OF HONG KONG. Applications accepted until filled. Position 1: The appointee will work in one of the following areas: Mass Communication, Digital and Social Media, and Graphic Communication; and is expected to conduct quality research, teach undergraduate and postgraduate courses, develop curriculum, supervise students, and undertake administrative and service-related activities. Position 2: The appointee will work in one of the two areas of (1) Public Relations, and (2) Visual Communication and Multimedia; and teach both theoretical content and hands-on skills. From language classrooms to outdoor markets, the workplace is fundamental to socialisation. The workplace is not only a site of employment where, for example, money is made and institutional roles are enacted through various forms of discourse; it is also a location where interactants engage in social actions and practices, from befriending or bullying a colleague to complimenting or gossiping about the boss. In other words, the workplace possesses cultural and linguistic norms and conventions for engaging in work and non-work related activities. Recently, the workplace has begun to attract the attention of scholars because of advances in communication technology, cheaper and greater options for travel, and global migration and immigration. Work is no longer confined to a single space. It now requires people to travel over great geographical distances, communicate with cultural ‘others’ located in different time zones, relocate to different regions or countries, and conduct business in online settings. The workplace is thus changing and evolving, creating new and emerging communicative contexts. Intercultural communication researchers have a long tradition of investigating the language and communication of such activities. The aim of the conference is to promote greater understanding of workplace cultures, particularly the ways in which working in highly interconnected and multicultural societies shape language and intercultural communication. The conference aims to encourage greater dialogue between researchers studying workplace issues with different theoretical and methodological frameworks, and between researchers and practitioners. Abstracts are welcome in any area related to the workplace, including pedagogical settings. The conference focuses on critical approaches to theory and practice, and we are particularly interested in studies that use practice to shape theory, and studies that question the validity and universality of existing models. Many Asian scholars, for example, have criticised some of the predominant models in intercultural communication for being Eurocentric/Anglocentric, and the conference welcomes papers proposing alternative frameworks for analysing intercultural communication in the workplace. Are you a student who is passionate about a free and open Internet? Do you love debating technology, media law and Internet policy issues? Then consider applying for a Google Policy Fellowship hosted by the Department of Media and Communication, City University of Hong Kong this summer! Hosted by the Department of Media and Communication and the Centre for Communication Research at City University of Hong Kong, the Google Policy Fellowship (Hong Kong) offers successful applicants the opportunity to advance research and debate on Internet policy and freedom of expression issues for a minimum of 10 weeks from June – August 2012 in Hong Kong. We are accepting applications for the position before April 15, 2012. Sponsored by Google, the research fellow will be rewarded a stipend of HK$58,500 (US$7,500) for ten weeks. The selection will be made by April 20, 2012. More information about the focus of the work our Google Policy Fellow will take on is described here. More information about the Google Policy Fellowship program is available in the FAQ.